The big day has arrived. You are picking your puppy up from the breeder. Make the trip home as stress free as you can for your new family member. The problem with car travel can be simple anxiety with vibration, sounds and sometimes movement. The problems may have developed even before the engine has started. It is important that the first trip is not a bad experience for the puppy that falls into a repeated behaviour pattern. Before the puppy leaves on his/her journey make sure the puppy is toileted, so there are no accidents in the car. Bring your partner or a friend to drive the puppy home so that you are able to nurse, cuddle & talk to the puppy so as to distract him from the car vibration, sounds & movement. Leaving his/her mother, litter mates and all that is familiar can be quite stressful to your puppy & may be the cause of some form of separation anxiety, so make sure you have planned routines that will enable you to be home with the puppy for the first few days. Not only does the puppy need to adjust to his new family but also to his new new surroundings. Keep the puppy involved with plenty of attention from his/her new family . If your human family are young and have not had a puppy before, spend time with the children and puppy teaching them how to play together and laying down some basic common sense rules on puppy playtime. PLAY SAFE – ALWAYS FULLY SUPERVISE CHILDREN AND DOGS DURING ANY INTERACTION. Parents have an obligation to monitor all child-dog interaction, until both child & dog have learned to play nicely together. There will be times when you have to protect the pup from the children or the children from the pup. Do not leave children alone with a new puppy. Inevitably, the pup will view small children as litter mates and will nip. Do not allow aggressive play or tug-of-war with the pet puppy. This can lead to aggressive behaviour and biting. Instead, throw a ball for the pup to chase. Do not allow the pup to join in running games with children. 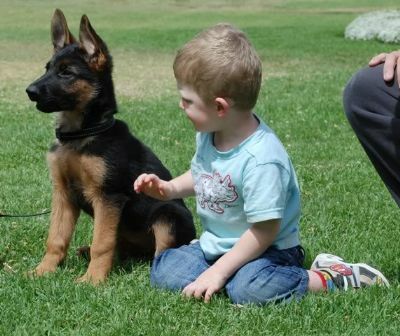 The pup will be encouraged to think of children as “prey”. Encourage children to think of the puppy as a sensitive & a living thing. It is not a toy. As a rule, new owners are advised that their puppy should be made sleep on their own on their first night in their new home. We at Kazkiri disagree with this idea as it can make your puppy anxious and consequently the puppy cries/barks most of the night, disturbing all family members. The next step is the owner acts in response to the puppy’s crying/barking by bringing the puppy into the bedroom, most probably cuddled up next to the owner in bed with them. Preferably, puppies should eventually sleep away from their owners. Conversely, puppies first night in his/her new environment is already stressful, as up until now he/she has had litter mates company, we do not want to add to his/her stress by isolating the puppy in a cold laundry/bathroom or kitchen. Here are some ideas that will enable your puppy to feel safe & secure on their first night in their new home. We partially cover the crate with a blanket, so that the crate is den-like. Add comfortable bedding. The bedding should also include the blanket that you provided the breeder with while the puppy was still with the mother & litter mates. Whenever the puppy sleeps during the day, especially if he/she does so on your lap, put him/her in the crate. Once the household has settled down for the night, ignore puppies whimpering and let him/her settle on his/her own. DO NOT GET ANGRY WITH YOUR PUPPY. If the puppy needs to go to the toilet through the night, take him/her but do not give any food/ attention just praise him/her for eliminating and put puppy back to bed. Don’t allow the puppy on your bed. Never play games with puppy in your bedroom, this is the place to sleep. The first few nights are going to be sleepless for the new owner and stressful for the puppy. Do not allow puppy to sleep on your bed. It may be cute when puppy is small, but sharing a bed with a 40Kg plus male German Shepherd is no fun, believe me I now! Whenever puppy falls asleep put him/her in their crate. The puppy will soon get used to the crate as the place to sleep in. Once the puppy is sleeping well in the crate you will be able to move it further away from your bed and gradually out of the room where you want the puppy to sleep.